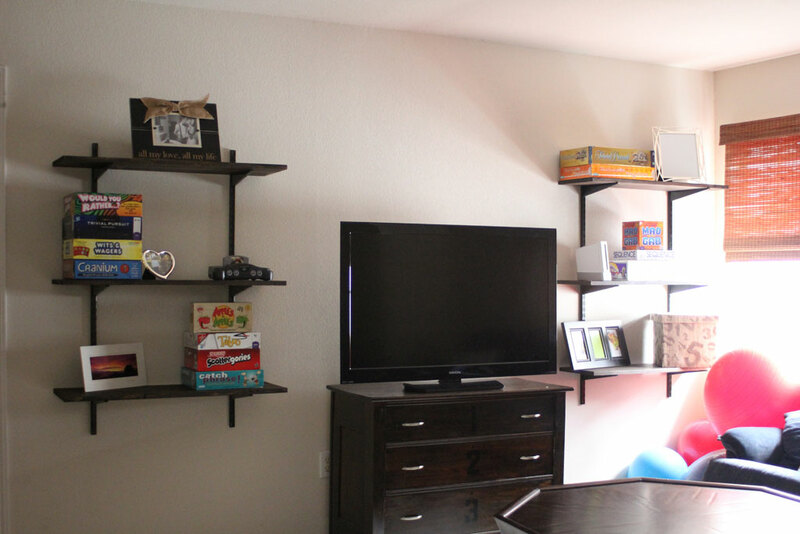 My next step in the bonus room upgrade was to hang shelves on the wall. If you remember from this post there is a wall behind where the couch was that is large and blank. 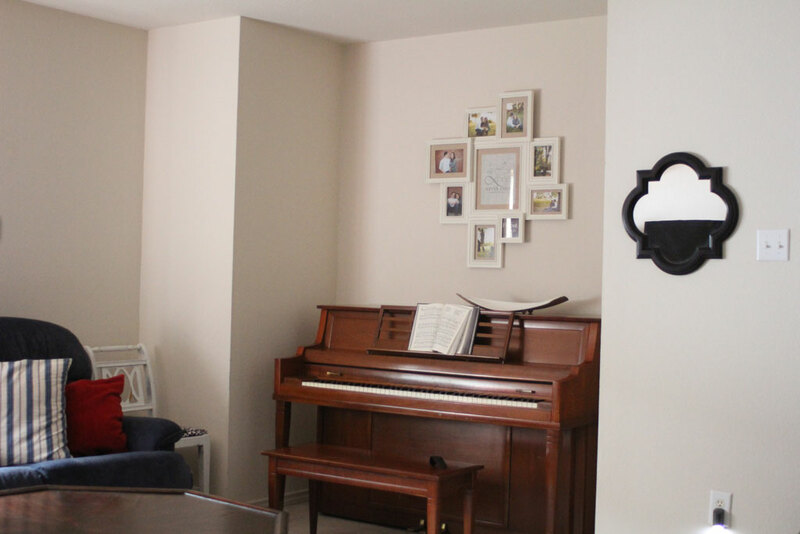 It made the most sense for us to put the television on that wall and move the couches over to the far wall with the window. Since we upgraded the dresser to put the TV on I thought shelving would look best on the wall, fill the space, and give us some additional storage for games. We don’t use this room much, but I’m hoping it’ll be a good place to play some board games. Eventually it’ll be a kids game room, but for now its just another living space. We love board games and for our wedding we registered for quite a few games, so we have a pretty extensive board game collection. I thought they would look pretty cute on open shelving and decided to continue the stained dark wood trend so we bought some black track shelving from Home Depot and 3-6′ 1″x12″ boards to stain for shelving. 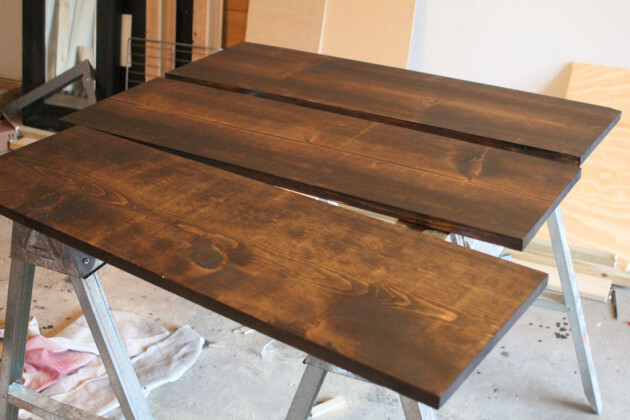 I used my leftover Varthane Kona stain… I’ll be posting a tutorial with all my staining tips later this week. But one quick coat on both sides of the board and we were good to go. Since I am going for the ‘rustic industrial’ look in this room and they won’t be heavily used (i.e. a table top) I didn’t put anything over the stain to seal it. 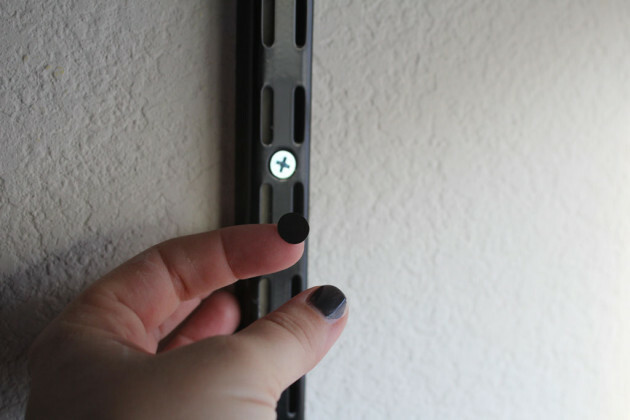 I thought it was pretty funny that these shelves from Home Depot came with silver screws and little black stickers to cover them up… high class! But it works, from far away you can’t see them. I love the way they frame the television. In hindsight I wish I’d hung them just a bit lower, but I still love the way it looks. And the rearrangement of the furniture has made the whole room feel better. And HEY look… we folded our laundry! And don’t worry… I’ll get some pictures put in these frames eventually.